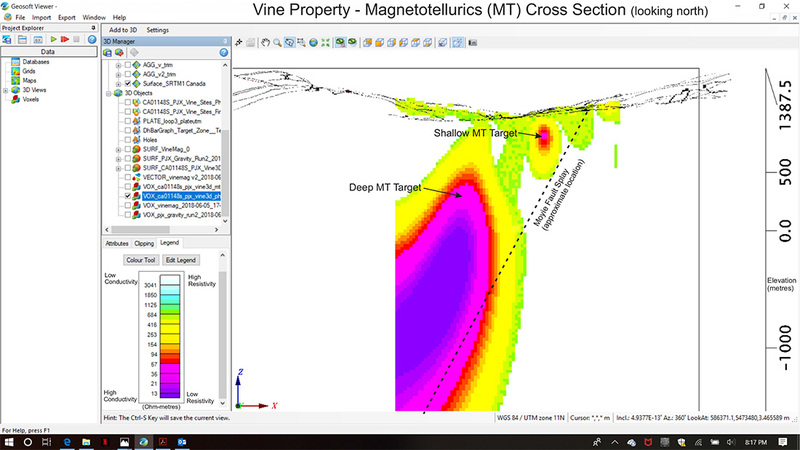 Toronto, Ontario – December 05, 2018 – Magnetotelluric (MT) geophysics has identified a large anomaly at depth that could be a massive sulphide body similar in area to the Sullivan Zinc-Lead massive sulphide deposit located 35 km north of PJX Resources’ 100% owned Vine Property near Cranbrook, British Columbia, Canada. Quantec Geoscience carried out a detailed MT ground survey on a grid pattern with MT stations at approximately 200 m intervals. Quantec’s 3D computer model identified the shallow and large deep MT targets. The computer program was given an arbitrary depth of 2 km for modelling. According to a Quantec geophysicist, the strongly conductive (low resistivity) large MT anomaly has a strike length of about 800 m, begins at about 600 m deep and can be traced to a depth of at least 2 km, the lower limit of the model. The anomaly may continue below 2 km and can be modelled deeper with the addition of MT stations further west. The shallow and deep MT anomalies occur within the large East Gravity geophysical anomaly identified by Excel Geophysics from gravity surveys in 2015, 2016 and 2017. 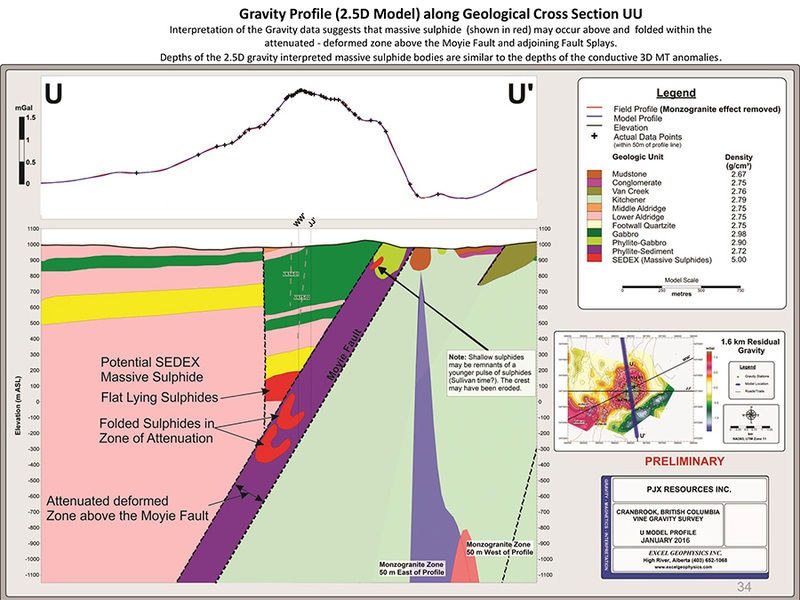 One of Excel’s 2D Models of the gravity data suggests that dense bodies of potential massive sulphide could occur at similar depths to the shallow and deep MT anomalies.